Why did the Chafetz Chaim repeatedly make a “mistake” in counting? What was the amazing connection between the patient’s tallis and tefillin – and the blood transfusion he needed so badly? 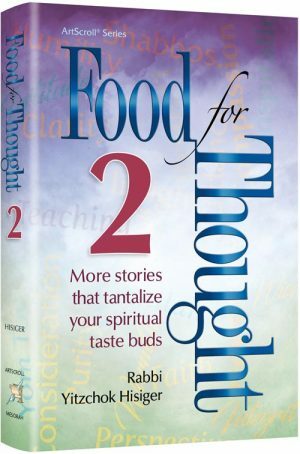 Thousands of readers enjoyed the first volume of Food for Thought. Here is a new collection of fabulous stories, many with surprise endings, some about renowned Torah personalities, others about “people just like us.” These 400-plus “bite-size” stories offer us unusual perspectives on the topics that reflect our lives and concerns: Torah learning, emunah, hashgachah, education, ethics and so many more. Rabbi Yitzchok Hisiger’s stories are like delicate, fine miniatures Â– small and so beautifully crafted. But while chocolate and cake miniatures turn into unwanted calories, these true stories turn into inspiration, insight, and delicious food for thought!